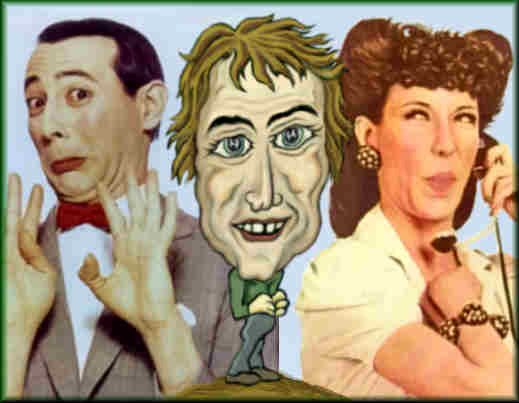 Pee Wee Herman and Lily Tomlin show us how Virgos can become overly critical and fussy. They also show how the mutable force in the Earth element can create the finicky need for perfection and the skewed physiognomy of Virgo. With highly analytical Virgo, the face appears to be divided into two separate halves. This is typical of most mutable signs but it is easier to see in the physical traits of Virgo–since the firming forces of Earth tend to hold the skewed features solidly in place. Note the off-set brows and squinted eyes, the split at the end of the nose, the gap in the frontal teeth and the “chipmunk cheek pouches”. These are the common physical traits that make up the physiognomy of Virgo. A Virgo Rising Sign or Moon will make the traits of Mutable Earth more obvious. Also, since MERCURY rules Gemini as well as Virgo, persons with a strongly aspected Mercury often will have a gift for expressing the inductive concepts of Gemini and/or the analytical deductions of Virgo. The Other Mutable Signs are Sagittarius, Pisces and Gemini. Virgo is the easiest mutable sign to detect, since the twisting patterns of mutability are solidified in the clay of Earth. With this in mind, he have gathered facial photos of six celebrities, who display the nature of Mutable Earth and the common physical traits of Virgo. Here, as with the others, we will demonstrate how different astrological components can alter the disposition, personality and physiognomy of Virgo Sun Signs. Melissa McCarthy and Adam Sandler both has Cancer Moons and a Mars in Leo. This activates and dramatizes their emotions, and what we see is some delightful theatrical lunacy! Since Melissa’s Moon trines Jupiter, her emotional leaps are more outrageous. Surprisingly, this makes this Virgo a disorganized and untidy lady. In contrast, Sandler’s Moon sextiles Venus. His comedy is far more relaxed. For both, their Cancer Moons make their faces more round than cubical. The physical traits of Virgo are not so obvious. With Jane Curtain and Jeff Foxworthy, we have two Virgo comics with astute gifts for observation. With his Gemini Moon, Jeff finds ways to catalog every item, to make it fit his “redneck” interpretations. In contrast, with her Moon in Taurus, Jane gets obsessed with the smallest imperfections and hangs stubbornly onto her emotions. Fortunately, with her Centaur rising, it all comes out as very humorous. Dr. Phil McGraw is the most grounded of this lot. For like Jane, he also has a Taurus Moon. In addition, he has six other components in passive signs, including his dreamy Pisces Ascendant and Mars in the depth probing sign of Scorpio. It’s no wonder his Virgo Sun is obsessed with revealing every detail and every secret in the lives of his guests. Last but not least, we have Amy Poehler, the liveliest wire of the lot. This is likely due to her Leo Moon and her wild and crazy Aquarius Rising. Also, it is no surprise that all of her components are in fire and Air signs–save for the four in Virgo. And since Pluto conjoins her Virgo Sun, the physical traits of Virgo run strong, but the extremes are usually under control. Physically, we see one eye planted some distance above the other. There’s also the long and thin-bridged nose that dips at the end, as it points in the opposite direction of the chin. Most of these traits can be observed in all of our subjects.